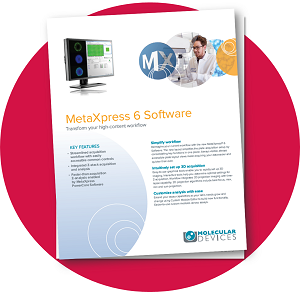 MetaXpress® Software is optimized to perform with the ImageXpress Micro imaging systems, giving precise control over image acquisition and powerful, elegant tools for analysis. Speed and convenience can be achieved with a single wizard which guides the scientist through image acquisition and analysis, laser-based autofocus, pre-designed image analysis application modules, parallel processor support, and automatic data transfer scheduling. MetaXpress ties together every step in an intuitive HCS workflow from acquisition to data management. MetaXpress software offers the precise control , needed to acquire images with the best possible quality. Crisp, high-resolution images using a range of objectives from 1x to 100x at various numerical apertures. Easy integration of live cell acquisition and quantification of 3D measurements of thick samples or kinetic assays using the acquisition and analysis wizard. Halving exposure time or increased assay quality by 30% using the digital confocal option in the acquisition interface. Modular toolbox sets up hundreds of routinely used HCS assays. MetaXpress software application modules give an interactive environment to quantify 2D and 3D measurements, including size, intensities and distance. Proprietary adaptive background correction algorithm adjusts image segmentation to the local intensity ranges and shape features within and between cells. This capability gives the most robust segmentation available in an image-based screening system and improves detection on both phase contrast and fluorescently labeled images. 18 MetaXpress Application Modules provide turnkey solutions for most common analysis routines. Through an interactive interface, these pre-designed application modules can be easily set up in minutes. The MetaXpressHigh-Content Image Acquisition and Analysis Software has been cited in more than 750 publications.